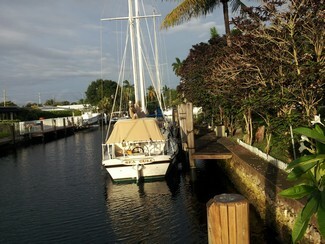 Dock will accommodate a boat up to 65' with a 5' draft, 75' of seawall. NO FIXED BRIDGES all the way to the ocean! Sorry no live aboards. Safely located behind a home in a great community. Electric and Water available. Available 6/15. $450/mo or $10/ft whichever is greater. email: [email protected] or call directly (305) 785-2986. Monthly Rate: $450 Mostly listings charge by "Flat Rate" per month.